How can I move files or folders? How does the Files area work? How can I change the view in the Files area? What can I do with the “Copy to photos” function? When your photos are uploaded in the Files area, you have the option of copying these to your Photo library. To do this, start out by right clicking on the folder of your choice. 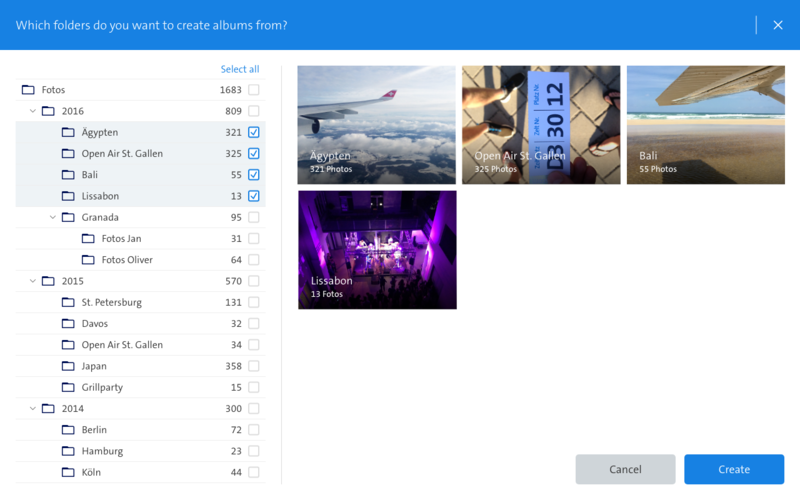 Then you can decide if you’d only like the photos to be copied to your Photo library or if you’d also like to create new albums. The advantage of creating albums is that it makes it easier to sort and structure your photos & videos and you’ll always have your most favourite moments at hand. Please keep in mind, however, that the album structure in the Albums area is flat, contrary to the folder structure in the Files area. This means it’s not possible to create sub-albums. Simply mark all folders in the left-hand column that should be used to create an album. The right-hand side will show you a preview of the album view.